The council’s transport and environment committee is about to determine its view on the proposal to close several roads and streets in The Old Town to traffic between 10am and 5pm on the first Sunday of the month in an 18-month trial starting in May. The “Open Streets” plan will include Holyrood Road, the Grassmarket and the Royal Mile as well as others that will form an “aspirational loop” which will open up spaces normally crowded with cars to pedestrians in what committee convener Councillor Lesley Macinnes describes as positive move, not a negative one. The council will endorse the plan and should be commended for doing so – it will be a significant step in catching up with many of Edinburgh’s counterparts on the Continent that have been operating similar schemes in their own cities for some time now. Such initiatives have been welcomed by the public, who have taken to the streets in their droves to enjoy the new-found freedom to walk in city centres without encountering significant volumes of traffic and toxic fumes. Copenhagen boasts the largest car-free zone in Europe. Pedestrian-only areas were established in the 1960s and it has completed 321 kilometres of bicycle routes which over half the population use to cycle to work. Madrid has banned all non-resident cars from the city centre and only vehicles with zero emissions, delivery vehicles, taxis, and public transportation are allowed. In Amsterdam most of the major connecting roads between the western and eastern areas of the city centre have banned motor vehicles and their traffic planners have reconfiguered the roads network to redirect traffic around the city. It also has a new metro line running north-south and there are calls to establish an east-west line too. As far back as 2002 Brussels introduced a mobility week to encourage citizens to use public transport and every September private vehicles are banned altogether for one day. It also signalled that it would ban deisel cars from the city centre back in 1998, with the ban coming into force in January last year. Milan has the worst traffic congestion of any city in Europe and in an effort to get people to leave their cars at home for every day that drivers don’t use their cars during working hours they receive a voucher worth 1.5 euros that can be used on public transport. Early this year Barcelona will ban cars that were manufactured before 1997 from the city centre and this will be extended across the region as a whole. Anyone getting rid of an older more polluting vehicle will be offerred a three-year pass on public transport. It is also actively considering a fuel tax to help fund public transport as well as a congestion charge zone. In Paris there is already a ban in place on older cars from the city centre on week days and if you ditch your car altogether you can claim around 620 euros to purchase a bicycle, sign up for a car sharing service or buy a public transport pass. Oslo will completely ban cars fron the city centre this year and is currently investing in public transport improvements and the developments of substantially more bike lanes. Some European cities that are comparable to Edinburgh are much further along the road in dealing with the issues surrounding private vehicle use and have put permanent measures in place to combat congestion and air pollution. Of course all such schemes must be tailor-made to fit the requirements of the city in question and the city council will be all too aware of the ill-fated Traffic Management Scheme which was implemented and abandoned shortly after it was introduced due to the traffic congestion it generated rather than reduced. Although some people have already taken to social media to belittle the forthcoming experiment this and other more vigorous traffic measure will surely be brought forward in the not too distant future. 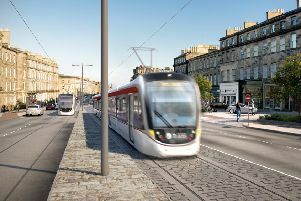 We have already heard mention of a ban on deisel cars in the city centre, a workplace parking charge and a potential congestion charge which, coupled with traffic infrastructure developments such as more bike lanes, improved park and ride and a tram extension to Newhaven, indicates that there is no lack of activity. When all is said and done, Edinburgh, like other major cities, will have to grapple with the problem of traffic congestion and air pollution. It is a pressing problem and will need bold and imaginitive action to solve it. The city council should follow the lead of other major European cities and should not be deterred by a minority of detractors. Our citizens deserve no less. The news that the development of the former railway goods yard at Haymarket appears to now be proceeding apace is more than welcome. The regeneration of this site has been long overdue, having been beset by planning and financial problems The fact that there is now light at the end of the tunnel will be cause for celebration amongst residents and businesses in the area. I have had cause to pass this site with depressing, tedious repetition on my way to Tynecastle Park (sometimes even more depressing on the way back – which has nothing to with the site lying vacant) and I have been looking forward to the day when a start will be made in fulfilling the promise that this vast area holds. I have also attended the annual Remembrance Service at The Heart of Midlothian War memorial on countless occasions and often wondered if the development of the adjacent site would impact on its setting. Indeed I should be surprised if the developer has not already taken this into account and will be aware of the significance of the memorial, not just to Hearts supporters but throughout the city, and although it is not within the site itself, it is close enough to merit consideration. My mate went to the doctor last week complaining that he was getting hard of hearing. The doctor asked him if he could describe the symptoms.